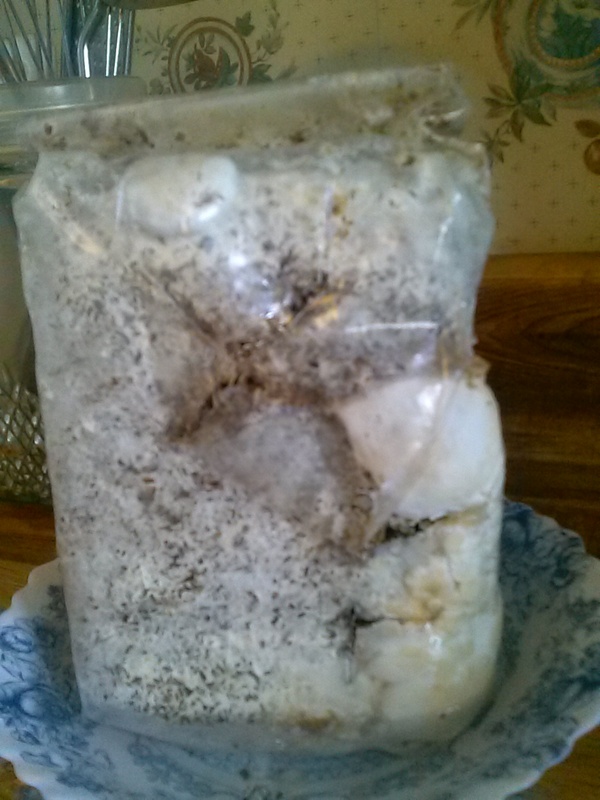 I have been wanting to buy one of the “grow your own edible mushroom” kits for a long time. I heard about morel kits, and since last year I couldn’t find morels in the wild anywhere, I decided I wanted to get a kit to grow my own. I found one website that had a special, where you could get an outdoor morel kit along with three other indoor edible mushroom kits, for a good price – under $80 for all 4 kits. Usually morel kits are $25-30 on their own, depending on which website you look at. I got my kits from the Gourmet Mushrooms website. The combo special I ordered is called “Gourmet’s delight.” It came with a morel habitat kit, a shiitake mushroom kit, an oyster mushroom kit, and a pom pom blanc kit. 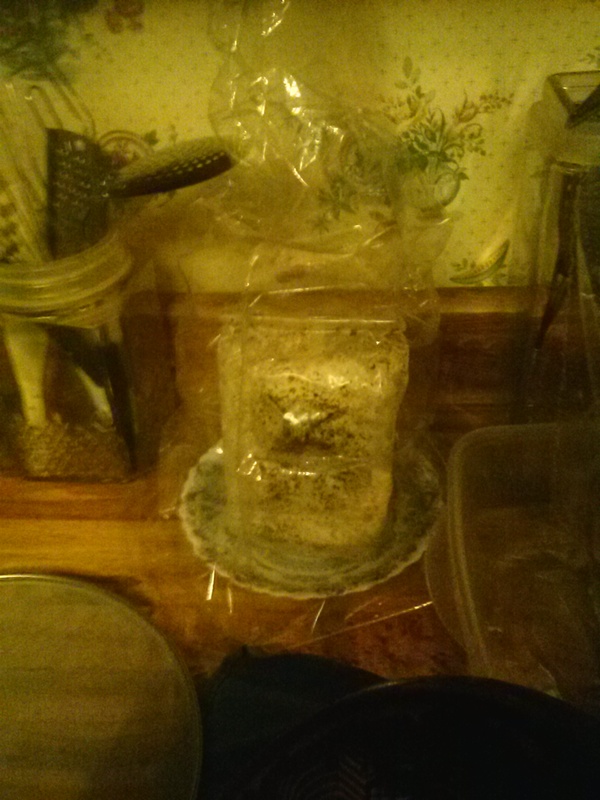 The morel kit is in the fridge until spring when I can get out and work the soil to plant them, and I won’t actually get mushrooms from it for a year or two. If it works it will be well worth the wait. When I got the kits I set up the three indoor kits right away. The kits consist of a “log” of sawdust or other material, inoculated with spawn of whatever type of mushroom. They come with instructions, and it has been pretty easy. We got a small flush of oyster mushrooms so far. I got pictures of them when they were first starting, but we ate them too quickly for me to get a pic of the fully formed mushrooms. I’m not sure if this first flush is over or if we will get some more oyster mushrooms. You can dry out the log between flushes, and it should give you 2 or three crops of mushrooms. The shiitake log has not formed a flush yet, but the instructions for that kit are a little more complex than the other two, and it says that they can take a couple weeks to start forming. I should see them start any day now. I’m excited for when they grow. 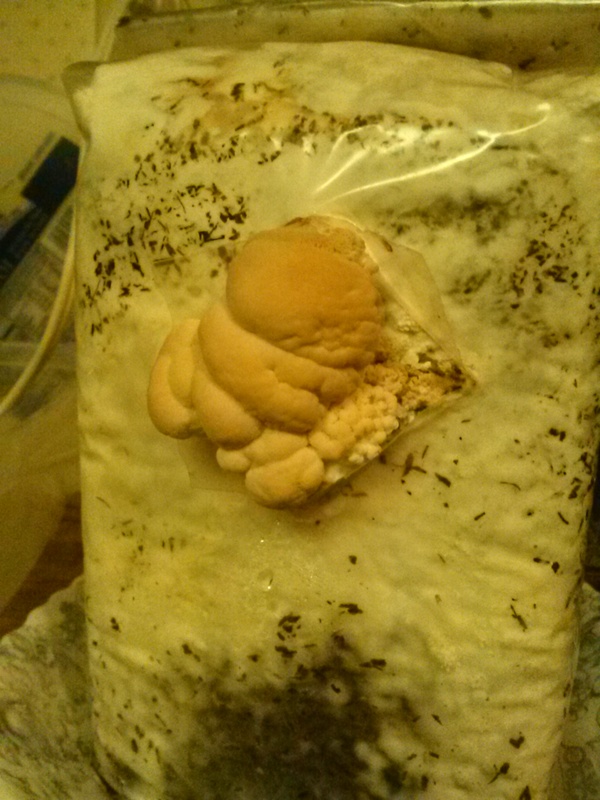 So far it’s been fun (and delicious) to grow indoor mushrooms. Previous Article Maple syrup time!